W. W. Norton & Company, 9780393248098, 320pp. The photographs of three young men had stood in his grandmother's house for as long as he could remember, beheld but never fully noticed. They had all fought in the Second World War, a fact that surprised him. Indians had never figured in his idea of the war, nor the war in his idea of India. One of them, Bobby, even looked a bit like him, but Raghu Karnad had not noticed until he was the same age as they were in their photo frames. Then he learned about the Parsi boy from the sleepy south Indian coast, so eager to follow his brothers-in-law into the colonial forces and onto the front line. Manek, dashing and confident, was a pilot with India's fledgling air force; gentle Ganny became an army doctor in the arid North-West Frontier. Bobby's pursuit would carry him as far as the deserts of Iraq and the green hell of the Burma battlefront. The years 1939-45 might be the most revered, deplored, and replayed in modern history. Yet India's extraordinary role has been concealed, from itself and from the world. In riveting prose, Karnad retrieves the story of a single family--a story of love, rebellion, loyalty, and uncertainty--and with it, the greater revelation that is India's Second World War. 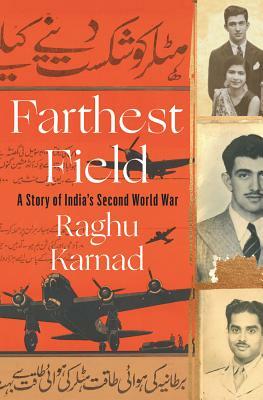 Farthest Field narrates the lost epic of India's war, in which the largest volunteer army in history fought for the British Empire, even as its countrymen fought to be free of it. It carries us from Madras to Peshawar, Egypt to Burma--unfolding the saga of a young family amazed by their swiftly changing world and swept up in its violence.